In Taekwon-Do, as in many other martial arts, gradings or promotion tests are used to gauge a student's progress and level of achievement. After a successful test, the student is awarded a new belt to mark their level, and begins to learn new techniques and patterns. The grading is a test of your Taekwon-Do skills and knowledge, and also of attitude and mental toughness. You are only required to know the elements learned at your particular level, although particularly good students may be asked elements form a higher grade in order to test them more thoroughly. In order to pass you must demonstrate that you know the majority of the syllabus for your grade; mistakes can be made and will not mean an immediate fail; but will be pointed out to you so that you can improve for next time. In ULTKD, we test students three times a year, usually towards the end of each term. 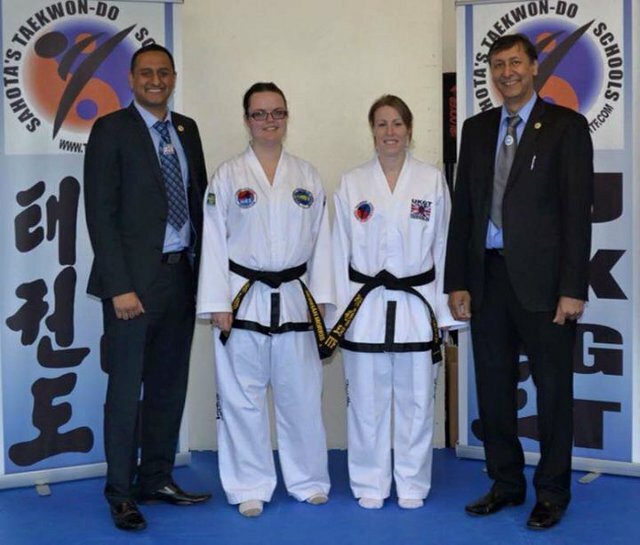 There are also opportunities to test seperately with Master Sahota for those that can't attend a club grading; these are held at his dojang, and involve either joining in with one of his regular gradings, or by special arrangement. There is also the opportunity to take an accelerated grading following Master Sahota's three-week summer course. Students are encouraged to train regularly in order to progress; the more you train the quicker you will progress and the easier you will find the grading. Students who do not train regularly enough, or who fail to make sufficient progress in between gradings may not be allowed to test, which is at the discretion of the senior instructor.